The night before last, Gideon slept like an angel. Last night was another story. Gideon and I were up most of the night. His ear was bothering him, plus I think he’s cutting another tooth. I may or may not have drawn a tear or two just out of exhaustion and wanting to sleep so badly. My patience began waning at one point, but I reminded myself that Gideon was just as tired and sleep deprived as I was. He obviously did not enjoy being awake when he should be sleeping. We were in the thick of it, but we were there together. This morning I brought Gideon to the couch to give him his morning bottle, and we shared about 30 minutes of snuggling and singing songs. It was a great boost to my weakened morale, and I had a really productive day. I’m hoping for smooth sailing tonight! This mama could use a good night sleep. Couldn’t we all? One of the reasons I love blogging is because I get to express my views and feelings openly. Blogging also gives me an opportunity to make sense out of my [often times overdeveloped] thoughts. Plus, it’s just a good way of journaling the way my mentality changes and evolves with experience and learning. I’m sure if I read some things I wrote three years ago, I’d hardly recognize myself. That said, I came across an article called “Stop the Mommy Wars: Empowering Photo Series” a while back. It really resonated with me, so I thought I’d share what the article talks about and how it impacts me on a personal level. Each photo in the series portrays two mothers holding posters that express their opposing views on everything from nutrition, to sleep training, to diapering. The bottom line of the whole project can be summed up in this picture. Moms come from different walks of life, different backgrounds. Moms come at parenting from many different angles. Moms approach their roles as mothers in so many different ways – countless means to reach a common end. As a courtesy to those around me, I make it a point to avoid ranting or talking about “the issues” in conversation unless asked. I can be a little bit of a chatter box, so it takes being very intentional about editing myself and confirming I have valid good reasons to speak. I’ve also always been extremely interested in other people. Why they do what they do. How they do what they do. Where do they come from. Where are they going. People are fascinating to me. When it comes to the topic of mommy wars, I am happy to report that – while I’ve dealt with the full gamete of reactions to the way I do things – I am generally surrounded by moms who are, at the very least, respectful of my views. They may lose interest in what I have to say 5 words in when I answer a question, but that’s ok. I don’t take it personally. Not everyone is interested in the same things that interest me. God knows why he made people so completely different from each other. It keeps things interesting! So as moms, let’s move the focus away from the need to express what we think, how we feel, and proving everyone else wrong. Let’s take a vested interest in what other moms have to say. We may disagree, we may have heard it a hundred times before, we may think to ourselves “that would never work for me!”. But we are all moms who love our children, so let’s support each other as fellow students of children. Our Creator wouldn’t have it any other way! The world will keep going round, whether or not we homeschool. The sun will keep rising and setting, whether or not we spank. So let’s enjoy our nights and days, encourage each other through our lives as mothers, and raise some happy, healthy children! What are some things you think keep moms in our culture from bonding? 1. I like writing things in order, and skipping Gideon’s first birthday is a big thing to leave behind. 2. The truth is, life has been quite eventful and I’m worn out by the end of the day. ~ Gideon and I have started attending weekly story time on Monday mornings at a nearby library, and we absolutely love it. The lady who leads the group loves what she does, and her enthusiasm is contagious with the babies. The library opens early for toddler story time, and we get special access to the children’s section before opening hours. We are loving picking out a few books each week! ~ Work has been going really well. I’m still sticking to a total of 7-9 hours a week. It’s just enough to keep me interested, not enough to make me feel like I’m evading my passion for being a homemaker and mom. Besides, Gideon only stays with Daniel while I’m at work. This means I get frequent picture updates that keep me positive. ~ March has been the official month for beginning my “mommy makeover”. With the help of some super gracious and stylish friends, I have found myself liking and wearing things I never thought I’d like or wear. brunch and mimosas with some fantastic young women. I love them so much. I am completely motivated to start taking better care of myself. The root of this change of heart and soul and mind? I want to enjoy my beautiful life with my hunky husband, precious baby boy, and wonderful friends and family! I know from experience that I enjoy life at a whole different level when I feel comfortable in my own skin. So, I want to feel comfortable in my own skin! ~ In that same vein, I purchased my first pair of size 4 jeans since I can remember. ~ They were black skinnies. Like I said, March has been eventful. ~ I got to watch a wonderful theatrical production of Pride and Prejudice with some wonderful friends. After the play was over, a very creative and romantic man decided to propose to the love of his life in front of everyone! What a night! Pride and Prejudice with friends! ~ My 31st birthday was the most special yet. I turned 30 as a mother, but I don’t even remember it. This year, Daniel made me a cheat dinner of spaghetti with meat sauce, and a wheat free chocolate cake, complete with his own adapted chocolate mousse icing infused with raspberries. This guy really knows his way to my heart. The whole meal was a hit, and everyone absolutely loved the cake. We had family over, and spent the night visiting and enjoying the little cousins. It was perfect. ~Enough of me. Gideon had his 12 month check-up. My sweet baby is a whopping 24 lb., in the 98th percentile for weight, 99th for height. I can’t say I found that too surprising. I get comments all the time when I’m carrying or wearing him, about how he is going to be as tall as I am by the time he gets to kindergarten. Plus, Gideon has been a bottomless pit for a stomach. ~ His weight and height has not really interfered with our baby wearing lifestyle. He loves being in a carrier, I love wearing him, and I’m going to enjoy the fact that he still wants to snuggle and be close to me for as long as I can. Gideon in the Ergo while we were in line to get Chipotle. Our first mother/son lunch out. ~ We finally sat down and planned our will. It’s currently being written, and we are both at peace knowing Gideon is taken care of if something happens to us. ~ Gideon got the 24 hour stomach bug that everyone and their dog seems to have right now. He started “spitting up” dinner on Saturday night, and didn’t keep anything but small sips of water down through Sunday night. Gideon got over the vomiting, but his fever didn’t let up. It lasted from Saturday night until yesterday night. We are not afraid of fevers, and believe it’s the best way for Gideon to have a stronger body as he gets older. Daniel and I decided to take the 24 hour approach that says to give baby a fever reducer if a fever of 102*+ persists for more than 24 hours. Gideon’s fever ranged anywhere from 100.3* to 102.5* at the highest. But it was never at 102* or above for more than an hour or two at a time. While his body fought the hardest, we watched Gideon like a hawk and made sure he was staying hydrated. Gideon would have a spurt when he would want to play and read books, and at other times he just wanted to cuddle with us and/or sleep with us. At any rate, we were able to provide the comfort he wanted and needed ourselves most of the week. Sick days, getting our snuggles in. On Wednesday night our poor little guy had his first rough night for sleep. Nothing Daniel or I did helped him rest better. We didn’t know if he had a headache or if his body ached, and comfort measures became necessary. After getting a dose of infant Advil, Gideon fell fast asleep and slept through the night. On Thursday we decided to take him to his pediatrician’s office because we wanted to make sure that everything was being taken care of in his little body. The nurse practitioner found some otitis media in Gideon’s right ear that had moved to his eyes. Now, I would usually turn down the antibiotic prescription and use garlic oil to clear his ears. It’s what I’ve used other times when he had a little ear infection, and it’s worked perfectly. But what with the infection being a little more substantial than usual, we decided to take the course of antibiotics. He received his first dose on Wednesday night, and by Thursday morning he was already looking and acting more like himself. ~ I was so relieved to find that his fever broke today! My baby is on the mend! To celebrate, we took advantage of the near 60* weather, and we went for our first fast walk. I want Gideon to have a fun, active mom and that means keeping him involved in my workouts. Phew! 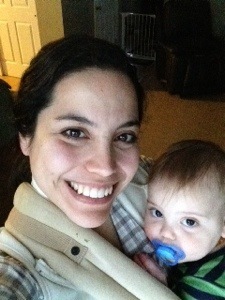 Now that I’m somewhat caught up (Gideon’s birthday entry TBD), I think I can get back on this blogging bandwagon. Yesterday was a blur! Gideon and I rushed through our day getting things done, baking, and decorating. I will go into more detail with pictures and more description of Gideon’s 1st birthday sometime this week. Tonight my computer is acting up, and I’m having trouble accessing the files from yesterday. Uploading pictures straight from my iPod has been super convenient for me lately, but yesterday’s pictures were all taken with the DSLR. I would work on it, but I just couldn’t be bothered tonight. Today was just one of those days. My energy levels were running extremely low, and Gideon had the sympathy mopes. We both felt like we’d been hit by the same train after partying hard, so I put house duties on pause and took a breather day. Gideon also ran a little bit of a teething fever, so we spent this Sunday in our PJ’s eating party leftovers, drinking lots of water, reading books, playing with his new toys, and cuddling on the couch together. Gideon is more cuddly than usual when he’s out of sorts, and I LOVE it. I even brought him to my bed for his morning nap, and we slept for 2 hours! I thought the time change would be rough on the little guy, but he did great going to bed tonight! I made sure there was no sunlight coming through the window, and followed his bedtime routine by the book so as to minimize any disruptions that might result in a night of broken sleep. No pictures today, but the overall report is: I was able to let go of some daily priorities and re-direct my attention to rest, recovery after a busy few days, and enjoying my sweet one-year-old boy. All of this makes for a good day. The forecast for the next two days is in the 60’s and 70’s. Glorious and long awaited for! Daniel will be off of work, so I’ll be busy enjoying great weather with my boys, but mid-week I’ll blog on Gideon’s birthday. I can’t leave that undocumented! Around this time 365 days ago, Daniel and I were at the hospital, Gideon’s arrival was imminent. This evening has been a little emotional for me. All day long I have found myself staring at him – which in itself is actually very common for me – and felt more joy than usual. My heart swells with pride and love and all those good emotions. Tomorrow is Gideon’s birthday and we are going to do a lot of celebrating. Gideon has a lot to celebrate, and so do Daniel and I as parents! Protecting and nurturing Gideon into a wonderful 1-year-old is the greatest achievement of our lives. Forget diplomas and jobs and promotions! Nothing has brought more challenges and joy to my life than being Gideon’s mother. I am a happier person than I have ever been. A lot of people tell me “you just wait. The terrible two’s will change your mind”, and I feel very sad. For them. Because all I seem to want to do is enjoy where Gideon is in the here and now, and look forward to what God has in store for us. That’s not to say that I don’t realize I’m going to fall flat on my face at times as I learn to train and develop my tiny independent thinker. I just don’t see the point in dwelling on the tough aspects of parenthood when I know full well that “He’s got the tiny little babies in His hands”. I decided to log some little memories of Gideon’s last night as an 11 month old. First and foremost, he took his first steps! He took a few steps from Daniel to the couch, and then did it again! For dinner he had pumpkin chicken bake, with a side of sautéed shallots, kale and carrots. The very last scoop of his formula. It was all that was left in the can, and we are never buying any more! We headed upstairs for our nightly quiet play time with more books, and then it was time for bed. I have given up on keeping his mirror smudge free. Look at that adorableness! Gideon having his last night time bottle as a 1 year old, and we read his current favorite book: “La Oruga Muy Hambrienta”. And here is a snippet I took of him right before going down for the night. We love him so much! It’s been a great year! This last tooth of Gideon’s has been a real doozie. Last night was the worst for sleep that he’s had in a long time. Discomfort eventually gave way to over-tiredness, and then he was inconsolable. All the partying and being up every 20 minutes or so caused me to completely forget to set my alarm in the morning. We woke up at 8:30 AM to Gideon fussing in his crib, and scrambled to get out the door by 9:00. Although our day got off to a whirlwind start, it was a really good one. We headed to our weekly Thursday Bible Study, and enjoyed seeing everyone. Daniel watched all of the kids, while us moms sat around the table and shared a delicious breakfast and good discussion. We are taking turns leading discussions on the book “Mothers of the Bible Speak to Mothers of Today” by Kathi Macias, and today was my turn. I got to read, learn, and reflect on Jacob’s wives, Leah and Rachel. 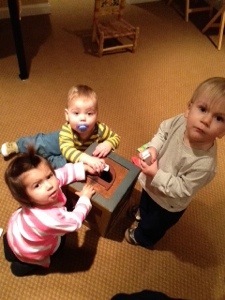 Daniel snapped this picture of Cecilia, Gideon, and Michael playing together. He told me that they played together for a long time, throwing dominoes in the box over and over again. Adorable children! We love them all! After Bible study, we headed to Daniel’s grandma’s house. I made extra food last night so brought lunch for us, my sister-in-law and her 3 kids. We enjoyed a delicious meal, and a good visit. The day got even better when Daniel let me take an hour nap when we got home. Glorious rest! I woke up to my boys climbing onto the bed with me, and we proceeded to have a wrestle and tickle session. Gideon is a ball of energy, and plays so hard! We went to run a quick errand, and then came home. We had breakfast for dinner, and Gideon started tapping Daniel on the shoulder every time he turned away. I got it on video! I have got a lot of work to do, and I’m excited for the fun excuse to do some exercise. Today was a good day. I didn’t get all the items checked off my to-do list, but I’m OK with that. Gideon wasn’t feeling too great. I questioned whether his moods were rooted in a molar making it’s debut, or possibly an ear infection. We stayed in and did our usual routine of work mixed with play in between. I finally put Gideon down for his afternoon nap, woke him up an hour later, and headed to the chiropractor. Gideon lay on top of me so I could comfort him since he was fussy. As soon as the chiropractor was done, Gideon collapsed on top of me, and didn’t want to move. He was so relaxed, and immediately felt better. I think he would have fallen asleep if I hadn’t had to get up. Gideon sat like a wet rag in his car seat on the way home, and didn’t make a peep. The rest of the day went much smoother. I only got one picture today. This evening I was cleaning the kitchen after dinner and Gideon was having none of it. He wanted me close and my full attention, and I am always happy to oblige. I get things done much slower when I wear him while I work, but it’s always worth it in the end. He is, after all, my sidekick. I was reminded tonight of how vital and significant it is to subject Gideon to songs of profession and prayer to our Creator. I happened to be singing a song that I’ve loved since I was in high school. My first experience ever with a youth group was at my family’s main supporting congregation. I was fourteen. I will never forget what a hard time I had keeping it together the first time I sat with a group of fellow teenagers and heard them singing. “The Greatest Commands” in particular almost sent me outside because my whole face hurt in an effort to keep the tears at bay. I yearned so much for that fellowship that I requested a tape recording of the youth group singing their favorite songs. When I received it, I locked myself in my room and lay in bed to hear every single one straight through. I still have that tape to this day. When Gideon sings songs to God, I want him to feel those same emotions. I want the words he is saying to always mean something to him. I pray that whenever Gideon goes through anything – good or bad – a song to God is the first thing that pops in his mind. It’s been too long since I last wrote on my blog. Life has been busy and blogging took a backseat. Even though there is a small part of me that regrets not writing an update at the end of the day, I am both aware and at peace with the fact that other things take precedence sometimes. 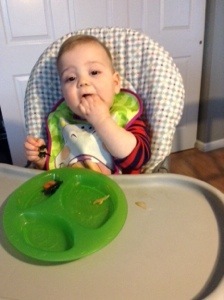 Gideon will be 1 year old at 12:56 AM this coming Saturday, March 8th. It has been such a wonderful year. Gideon has brought so much joy to Daniel and I, and we always talk about how we can’t imagine life without him. He is a part of our lives, and a part of our family. I find his little socks under the sheets in the morning when I make the bed, he’s “hidden” the remote and refuses to tell us where he put it, and there are traces of his presence in our home strewn all over the house. Here are a few pictures of the past week or two. Play dates with mommies and babies from our Bradley Birth Class. Here is Gideon and his friends jamming on a coffee table. He has so much fun with his friends! I finally received my Valentines Day cupcakes in the mail, and was beyond thrilled. We got a double order since they were late, and got to have friends and family over to share and enjoy them with. Beautiful, delicious cupcakes! We didn’t mind cheating at all! It was Daniels’s long weekend off, so we got to have a lot of fun together. It all started when we realized Gideon had outgrown his Britax pumpkin carseat, and bought his first convertible car seat! He loves it, and looks like such a big boy. We’ve decided to have him rear facing as long as possible, but he doesn’t mind it at all. He loves reading books in the car, so it’s especially adorable to look in the mirrors and see nothing but an open book (often times upside down) and his little hands. I’ll have to get a picture of that, because it melts my heart. He’s a bookworm like his mama! Yesterday it was sunny and a toasty 50 degrees, glorious weather, so we spent most of the day out and about. Daniel and I went on our first date in a long time in the morning/early afternoon while Gideon stayed with Daniel’s parents. We headed to a local coffee shop, and then watched “The Monuments Men”. It was a great time, and at the end we were refreshed and excited to pick up our little man. In the afternoon, we went to REI to pick up Gideon’s main birthday gift. We decided to get Gideon a front sitting bike seat for his first spring and summer as a toddler. I haven’t seen Daniel so excited about something in a long time. He can’t wait to take our shorty off-road biking. Daniel did not want to order online, because he wanted to make sure Gideon liked it and fit in it well. It was mounted and ready on Daniel’s bike minutes after we got home. If I know Gideon as well as I think I do, he is going to absolutely love riding in his front bike seat. We are making it a goal this year to spend as much time in the outdoors as possible. This winter has been rough, long, drawn out, and extreme. We are expecting another snow storm tonight, and I’m hoping it’s the last until next winter.